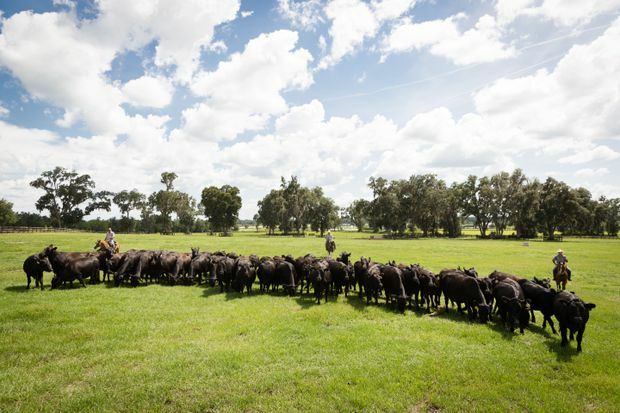 Stretched over the rolling hills of Marion County in northern Florida, a cattle ranch that was Frank Stronach’s vision of the future of farming is now a focal point in his court feud with his daughter. One of the areas of friction that Mr. Stronach outlined in his $520-million lawsuit against his daughter Belinda Stronach was the fate of the Adena Farms, north of Ocala, Fla., which the 86-year-old tycoon had conceived as a supplier of grass-fed, organic beef. The farm was to be complemented by a golf course and a country club that would sell and serve natural foods. Men on horseback corral grass-fed cattle on Frank Stronach's farm in Marion County, north of Ocala, Fla., on Aug. 11, 2016. Mr. Stronach said the cattle business, into which he had funnelled hundreds of millions of dollars, was jeopardized by his daughter and her perceived ally, Alon Ossip, chief executive of The Stronach Group (TSG), the unit of Mr. Stronach’s empire responsible for horse racing and gambling in addition to the cattle farm. He accused them of laying off employees, cancelling leases and cutting funds at a critical juncture in the project. “Regrettably, Belinda and Alon became unfairly and improvidently dismissive of Frank’s vision for Adena Farms and Adena Golf,” the statement of claim by Mr. Stronach said. Filed on Oct. 1, the claims have not been tested in court. 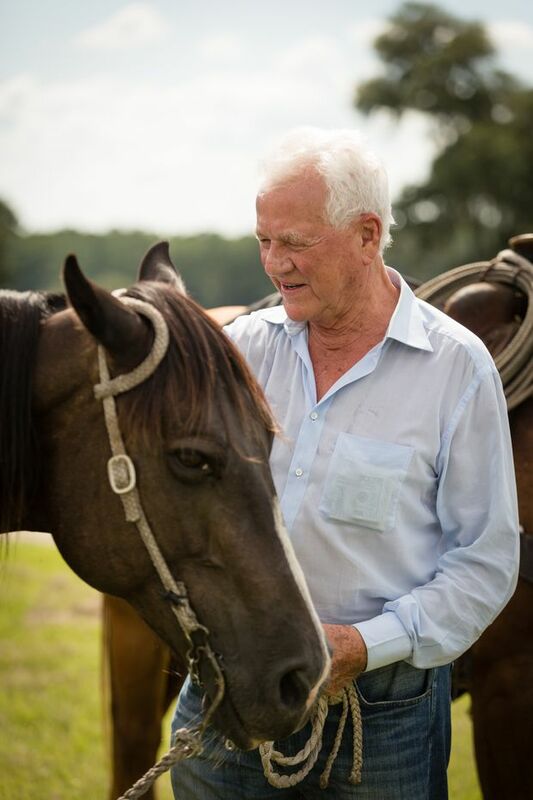 Frank Stronach is pictured with a horse on his farm in Marion County, north of Ocala, Fla., on Aug. 11, 2016. According to his statement of claim, Mr. Stronach began to set up his cattle business in 2008. Within four years, a local newspaper, the Ocala Star-Banner, noted that he had become the biggest private land holder in Marion County through purchases made by five different corporations. TSG ended up with some 90,000 acres that were cleared into pasture. The US$300-million expenditure also included the acquisition of livestock and the building of a slaughterhouse, Mr. Stronach’s court filing said. Mr. Stronach’s beef business and his attempt to start a new political party in Austria pulled Mr. Stronach further away from Magna International Inc., the auto-parts empire he founded. He relinquished control of it in 2010. He also had support from some Florida politicians. The Miami Herald reported that in 2012 a Republican member of the Florida Senate tacked an amendment to a fiscal bill so that Mr. Stronach’s meat plant would get a break on its electricity taxes. In Marion County, environmentalists went to court in an unsuccessful bid to deny Mr. Stronach a new permit to pump more groundwater than originally allowed when he purchased the land. They were concerned because the local water system was not meeting proposed minimum flows and levels under Florida law. There was also controversy after a TSG representative told a local school board in 2014 that Mr. Stronach would finance a state-of-the-art high school athletic complex. A year later, TSG donated only US$125,000 and said in a media release that the earlier, more lavish, pledge had been made without authorization. Now, Mr. Stronach says in his court filing that the fate of the farm itself is in doubt.